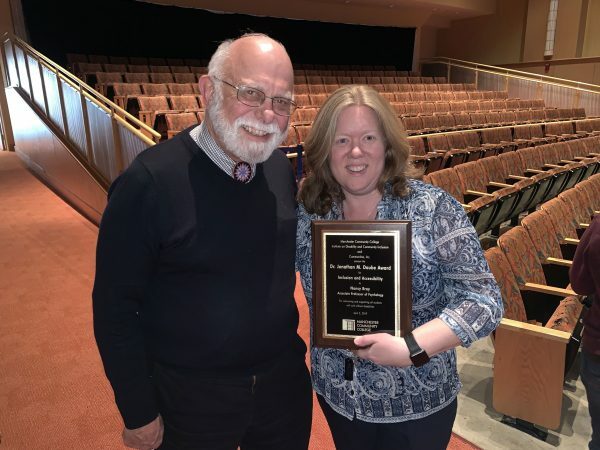 MANCHESTER, Conn. (April 5, 2019) – Associate Professor Nancy Bray, Assistant Director of Educational Technology Tim Boto and Web Designer/Developer Adam Saucier were each awarded the 2019 Dr. Jonathan M. Daube Award for Inclusion and Accessibility. The award was established to honor an outstanding member of the college community who continues the legacy of inclusion and accessibility demonstrated by Daube during his years of leadership as president of the college. This year’s award was presented by Dr. Daube — along with Director of Institute of Disability and Community Inclusion George Ducharme — at a ceremony at MCC’s Disability Awareness Day on Thursday, April 5. Dr. Daube was president of MCC from 1987 until his retirement in June 2008. Nancy Bray receives her award from George Ducharme. Bray, a resident of Manchester, was recognized for her partnership with MCC’s Disability Services team to develop new approaches for supporting students with health concerns. Her award cites her for embracing universal design in her teaching and maintaining high academic standards while providing learning opportunities for students from a broad range of learning types. 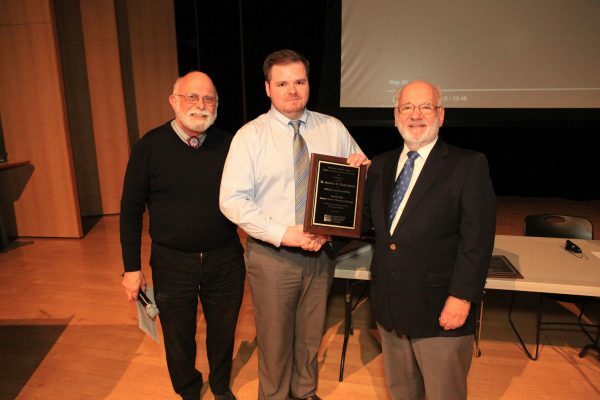 Tim Boto, center, accepts his award from George Ducharme, left, and Dr. Daube. Boto, a resident of Manchester, works behind the scenes to create an accessible environment for students with disabilities. His attendance at academic division meetings has spurred discussion and promoted the accessibility tool Blackboard Ally, which is embedded in the online Blackboard teaching tool. The result is a flexibility that meets Federal ADA requirements and is designed to enhance access to course content. 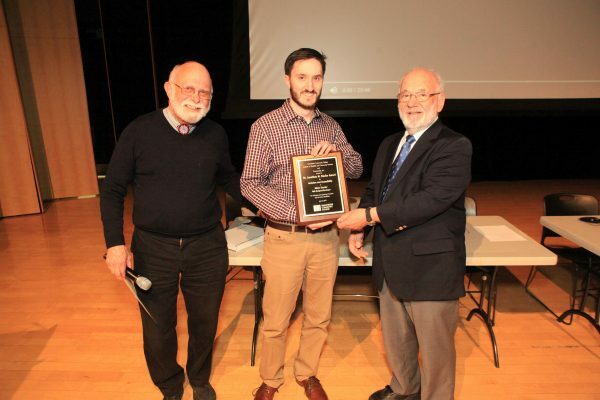 Saucier, a resident of New Britain, also was honored for his behind-the-scenes dedication to accessible web environments for students with disabilities. He has conducted a workshop to discuss legal requirements and to share the best practices for creating web pages and course materials that are accessible for all students. Adam Saucier accepts his award. Also part of the Disability Awareness Day program was the screening of “Jeremy the Dud” — a short film dramatizing the implications of trying to find employment in a world that is biased toward people who have disabilities. The film was followed by a panel discussion with MCC students who have disabilities. The event was sponsored by the Institute of Disability and Community Inclusion and MCC’s Disability Services.